This months kit is right on trend with metallic foil! The kit for August includes supplies to make 3 gold stripped foil cards, 3 pink ribbon foil cards and 3 polka dot foil gift boxes. 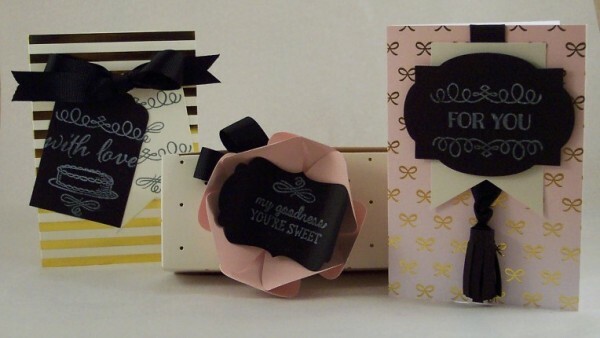 Included are 6 pre-scored foil pattern cards, 6 envelopes, 9 die cut label shapes, 6 flag die cut shapes, black ribbon, 3 ready to fold gift boxes, dimensional paper flower die cuts, a white ink pad, a clear stamp set and adhesive. 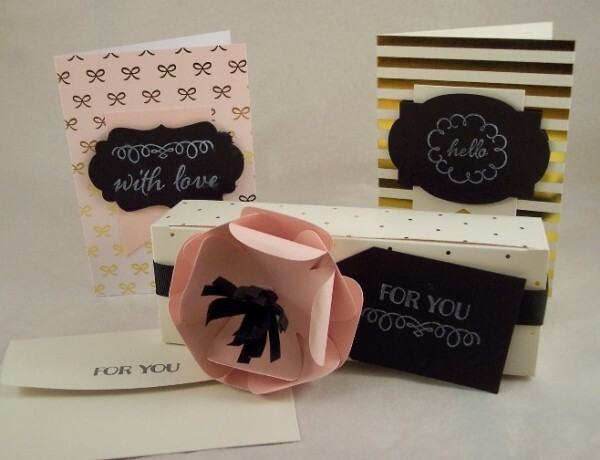 For my projects shown at the very top I followed the instructions in the kit making the 2 cards and the gift box. Next I changed things up a bit and added a cake stamp from the Big Day stamp set, tying the ribbon in a bow over top of the tags. For the second card I used some of the ribbon and the inside of the flower to make a tassel down the front of the card. And for the gift box I placed the label inside the flower using a stamp from the All Boxed Up stamp set and used some of the ribbon for flower petals. Or you have a chance to win this months Paper Pumpkin kit! The generous folks over at Stampin’ Up are offering to giveaway a kit to one lucky Craft Gossip reader, simply leave a comment below to be entered, one comment will be randomly chosen. One comment per person, open to US residents only. Giveaway runs from today through 8/25/15. Love all your crafting stuff!